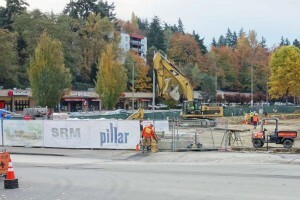 EHSI provided professional hazardous materials consulting services for the demolition of a former KFC building located in Bellevue, Washington. The client planned to demolish the building for a new development complex. EHSI completed a Limited Hazardous Materials Survey of the building. EHSI collected samples and quality assurance (QA) samples of suspect asbestos containing material (ACM). A review was conducted of previous surveys “as built” drawings or renovation records and a limited destructive inspection was performed. EHSI used a hand-held x-ray spectrum analyzer to determine the lead content of suspect lead containing materials (LCM), and inspected a representative number of each type of fluorescent fixture for the presence of PCBs and mercury. A survey report was submitted that identified hazardous materials were to be impacted by the planned demolition activities and provided appropriate recommendation for abatement. During the construction excavation phase, EHSI provided a health and safety plan (HASP) and onsite chemical-specific worker health and safety monitoring and consulting services in support of soil remediation disturbance activities on the property. EHSI conducted onsite negative exposure assessments (NEAs) that occurred near the beginning of disturbance of soils with high concentrations of chemicals. EHSI monitored ambient area air concentrations of chemicals of interest using hand-held detectors including PIDs, and detector tubes. PID measurements were taken regularly at timed intervals. Daily Logs of “on-site” activities and written reports with the results from NEAs and other analytical results was provided. This entry was posted in Commercial Real Estate, Industrial Hygiene and tagged "Good Faith Survey", Negative Exposure Assessment by Nancy Yee.